France was informed of a planned terror attack on its team at the Olympic Games in Rio de Janeiro, the head of French military intelligence has said. Gen Christophe Gomart told a parliamentary commission in May that a "partner agency" warned of the plot by a Brazilian Islamist militant. Gen Gomart made his comments at a commission hearing into last year's attacks in Paris. The transcript of the hearing has just been made public. Brazil's institutional security cabinet - which oversees the country's information services - told the AFP news agency it had received no information about the threat from the French authorities. "We were not the source of information and the Brazilian intelligence agency (ABIN) was not officially informed either of this matter," a spokesman said. 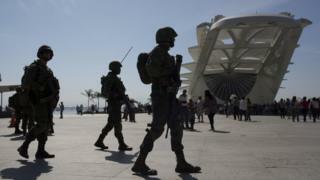 In July, Brazilian Justice Minister Alexandre Moraes said a jihadist attack in Rio during the Olympics was a "possibility" but "not a probability". About 85,000 security force members including 47,000 policemen and 38,000 soldiers will be on duty to ensure the safety of 10,500 athletes and officials, journalists and tourists from around the world who will be expected to attend the 5-21 August Games. A spokesman for a special secretariat at Brazil's Justice Ministry - which is spearheading security efforts for the Olympics - said that Brazilian officials and their foreign partners have increasingly been monitoring communications between suspected sympathisers of radical groups. They have said that the biggest worry is not a co-ordinated attack but a lone actor or group targeting the event. On Tuesday the federal government said it was releasing additional funding to beef up security ahead of the Olympics. Brazil's Sports Minister Leonardo Picciani said the armed forces would get an extra $24m (£18m) to help them meet security needs.